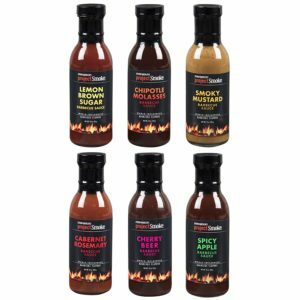 Pulled pork turns up throughout the South, with vinegar sauce and slaw predominating in North Carolina and mustard sauce in South Carolina. This is super simple, but triumph lies in the details, like crisping the pork skin over the fire and buttering and toasting the buns. Step 1: Set up your grill for indirect grilling and preheat to 250 degrees. 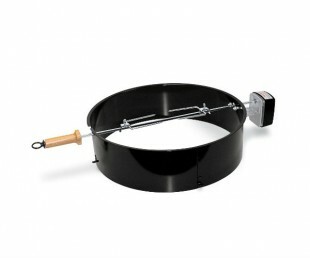 Use BBQ Guru’s PartyQ to control the temperature on your grill for maximum effectiveness. Step 2: Season the pork shoulder on all sides with the rub, massaging the spices into the meat. Step 3: Place the spice rubbed pork shoulder fat side up in the center of the grate over the drip pan. Why fat side up? So the dripping fat bastes the meat as it cooks. Step 4: Now toss a handful of soaked wood chips on each mound of coals. Cover the grill and smoke-roast the pork until it’s the color of mahogany and as tender as a broken heart, 7 to 9 hours. The internal temperature, measured with an instant-read meat thermometer, should be 195 degrees. Step 5: You’ll have to add fresh charcoal (preferably natural lump) every hour. (Leave the grill lid off for 5 minutes when you do so the new coals have plenty of air to ignite.) You should also add a handful of wood chips to each mound of coals every hour for the first 3 hours. If you’re so inclined, after the first hour, open a beer, cover the mouth of the bottle with your thumb, then shake it a little. Gradually slide your thumb back a little and direct the resulting stream of beer on the pork shoulder. This keeps it moist and gives it extra flavor. Also, it looks cool, and you should never underestimate the power of looking cool. Step 6: The next step is to make the sauce and slaw. For the former, combine the mustard, brown sugar, vinegar, and liquid smoke in a saucepan over medium-high heat and boil until thick, whisking to mix, 5 to 10 minutes. Let it cool to room temperature. Stir 1 cup of sauce into the chopped cabbage to make the mustard slaw. Reserve the remaining sauce for serving the pork. Step 8: Pull any skin off the pork shoulder and set it aside. Remove and discard the bone and any big lumps of fat. Chop the pork into small pieces with a cleaver, displaying all the showmanship you can muster. Place in a large bowl or roasting pan and stir in about 1 cup of Mustard Barbecue Sauce. Step 9: Meanwhile, rake the remaining charcoal in the grill into a mound. Brown and crisp any pork skin over the hot fire on both sides. Then chop it into small bits (these are called “brownies”) and mix them with the pork. Step 10: Brush the buns with melted butter. Arrange the buns on the grill grate directly over the coals and toast each until golden brown. (Watch carefully.) A lot of folks forget this step and their pork sandwiches suffer for it. 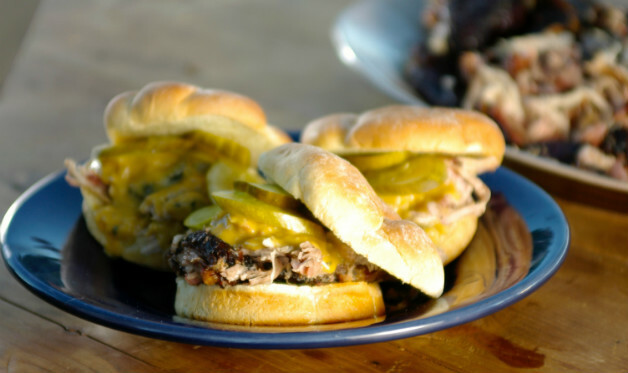 Step 11: Pile a generous mound of pork onto each bun. Top with mustard slaw. Serve any remaining slaw and/or sauce on the side. Prepare to taste paradise. 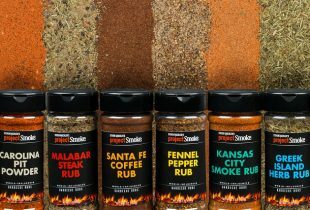 Note: I’m partial to my Best of Barbecue All-Purpose Rub, but you can make your own by combining equal parts salt, pepper, paprika, mustard powder, and brown sugar. Whoops. I just gave you the secret formula. 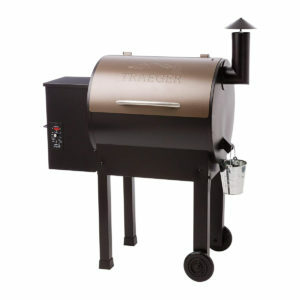 Tip: Use BBQ Guru’s PartyQ to control the temperature on your grill for maximum effectiveness.